100ml Diffuser with hand-made Solar flower instead of sticks. The oil is drawn up the absorbent stem and the flower changes to the same colour. 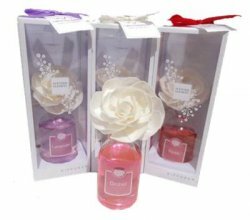 Three colours / fragrances: Red - Rose, Pink - Orchid, Purple - Lavender. EXTRA DISCOUNTS FOR ASSORTED CARTONS OF 12.